In addition to being a mechanical genius and a humanitarian, D. W. Onan also was a philosopher. He was fond of putting down on paper his thoughts on a variety of subjects. It was No. 8—-one-product concentration— that, more than any other factor, exemplified the Onan Company, seemingly by accident, but in view of D. W. Onan’s philosophical jot-tings, a planned strategy. The Onan Company started with tools to repair motor cars, quickly switched its emphasis to the “Safty Saw”, and before a decade had passed it was producing generator sets, a product the firm has stayed with ever since. D.W. Onan liked the idea for several reasons. His “Safty Saw” business was booming, and for the first time in years he had some spare time on his hands. He now also had a “partner” who, like Dave, loved mechanical challenges. The partner was his oldest son, Charles Warren Onan, or “Bud” as everyone called him. Bud, who had reached 16 on May 30 that year, had quit high school and gone to work full-time for his father. Like his father, Bud was exceptional with anything mechanical, and both were excited about the prospects of designing a gasoline-driven generator set, not so much as a possible product for the company, but just as a project for their restless imaginations. Bud and his father decided to start with equipment familiar to them. The highly successful “Safty Saw” used a Master motor and a Briggs & Stratton air-cooled gasoline engine. 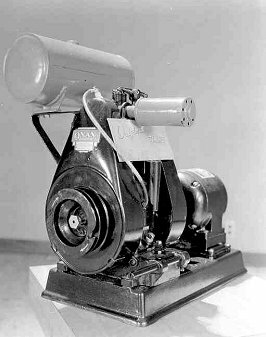 They decided they could easily convert the Master motor into a direct current generator that could be operated by the Briggs & Stratton engine. After several months of work, they built a 300-watt, 115-volt, direct current generator set, and gave it to George VanWagenen in the Spring of 1927 to try at his Lake Mille Lacs cottage. Bud Onan discovered that the flickering had been caused by the cyclic irregularity of the single cylinder engine. The problem was finally solved by connecting the generator to the engine with a spring coupling that allowed the generator to turn at a constant speed regardless of engine speed variation. After testing the unit several times, and increasing the power to 350 watts, the Onans were satisfied they had a product they could market. They called it the Onan Ten-Lite Generator. The Onans sold the Ten-Lite Generator for $99 plus $12 for 10 30-watt light bulbs and enough wiring to string them around a small home. It was a vast improvement over existing battery-powered systems. The market for the Onan generator was primarily in rural areas where “city power” wasn’t available. Dave Onan knew how to market his new product, too. He had a formula that was foolproof and the hardest-working advertising manager of any small company around. She was Nell Tangen, who joined the Onan Company right out of school in 1923, and she not only handled the advertising but was a secretary, bookkeeper and office manager. It was her conscientious attitude that not only made her an invaluable employee for 35 years but landed her the job in the first place. Dave Onan had advertised for a secretary for his new business and Nell Tangen’s school was looking for jobs for their students. The school suggested to Nell that she go to the Onan “plant” at 43 Royalston and apply for the job. When she reached the address and saw only a dilapidated three-story home, Nell was sure she had the wrong address. When she looked inside and saw a messy office with no one around, she didn’t know if she wanted to work there anyhow, so she left. A few blocks away, Nell decided she just couldn’t go back to her school without a better story than the one she had, so she returned to the Royalston address. Dave Onan had been out in back the first time Nell looked in, but he was in the office when she returned. Nell inquired about the job and Dave Onan hired her on the spot. It was the beginning of a long association that ended when she retired in 1958. The advertising program, which Dave Onan formulated and Nell Tangen carried out, consisted of small but frequent ads in magazines such as Popular Mechanics, and a direct-mail project targeted at past customers. Dave Onan was sold on this approach, and he used it faithfully throughout his years with the company with about the only change being slightly larger ads as the business grew. To start with, the ads were mostly one-column by one or two inches. A typical ad had a picture of an Onan generator set with a small headline at the top reading, “COMPLETE ELECTRIC LIGHT PLANT.” The headline was squeezed between two reverse blocks of type, one that said, “ELECTRIC LIGHTS ANYWHERE,” and the other which said “$99,” which for years was the lowest priced model. The ad had the Onan name at the bottom and an address that varied with each ad. That was Dave Onan’s key. Whenever he received an inquiry by mail, he could tell which ad had produced the response. For instance, the ad that ran in the October Popular Mechanics would carry the address of 6 Royalston Ave. while the ad in the November issue would have 7 Royalston Ave., and in December it would be 8 Royalston Ave, Those were the days when the mailman knew where the Onan mail should go even if the address was wrong. In 1958, the year she retired, Nell Tangen wrote a letter to C. F. Minor, Sr, an advertising representative with Popular Mechanics, in response to some correspondence from him. The letter said: “Your letter brought back many pleasant memories of the regular calls you made on Mr. D.W. Onan and me for over 25 years. Do you remember your visits to us when the office was in the living room of an old home and we had a total employment of approximately 30 people? And do you remember the first one-inch keyed ad? In those days, it was sometimes hard to scrape together the $45 for the 14 line ad. “I recall the first key we used was 2 Royalston Ave. and over the years we used keys as high as 9000 before moving to our present University Avenue location. “In some old ad records, I notice Popular Mechanics circulation in 1931 was 590,115, a far cry from the 1957 circulation of better than 1,330,000. Mr. Onan had great faith in the inquiries received from Popular Mechanics for these were always backed up by sales, too—and quite a few in foreign lands long before we began using Mecanica Popular, the Spanish edition. “A mighty interesting record, wouldn’t you say. “I haven’t carried the title of Advertising .Manager for many years now but sat in on an ad meeting just a week ago where the tentative 1959 ad schedule was being reviewed. Popular Mechanics was, as usual, down for a 12 month consecutive schedule, which will make an uninterrupted schedule since February 1929—over 30 years. During that time we grew from a very small organization to better than 2,500 employees during World War II and back down to our present 650. The Onan advertising strategy, which over the years resulted in an average of about $18 in sales for every dollar spent, was complemented by frequent mailings to past customers, especially when new, improved models were introduced. D.W. Onan also insisted on personal follow-up, usually by mail, to all company sales. Nell Tangen remembers that Onan insisted on going through all incoming mail every day, and any problems or complaints were immediately answered by him personally. Opening the mail was one of the highlights of the day for D.W. Onan, almost a morning ritual in the old house on Royalston Avenue. D.W. Onan’s office was in the front sunroom while his secretary, Nell Tangen, worked in the front foyer. As business increased, two other secretaries were hired, and they worked in the living room. A draftsman worked in the dining room, and Bud Onan did his design work in the kitchen. When a complaint came in the mail, you could hear D.W. Onan’s soft grumbling if you were nearby, but when he opened a letter containing a large order or a badly needed check, you could hear his excited exclamations of joy throughout the entire house. Not surprisingly, sales of the new Onan Ten-Lite direct current generator sets were slow at first. One factor that contributed to this was the fact that power from electric utilities is alternating current. Therefore, most lamps and appliances were designed for alternating current, and they were therefore less expensive than direct current lamps and appliances. The alternating current problem was compounded when the first AC radios came out in late 1928. Both D.W. Onan and the engineers at Master Motors agreed it would not require much of a change to convert the direct current generators to alternating current units. Without changing the basic structure, the DC generator was modified by adding a collector ring and rewinding both the stator and rotor. The same coupling was used only with a slightly larger diameter and a flywheel was attached ahead of the coupling. Different springs were needed on the coupling and rubber bumpers were attached. The first AC generator produced by Master for Onan was a 500-watt unit. It was the country’s first portable, gasoline powered AC generator, and it opened an immense new market for Onan. The major suppliers of radios in the late 1920s were Wells Gardner and Stewart Warner. In late 1929, just before the stock market crash and the start of the Great Depression, D.W. Onan, proving once again he was a good promoter as well as a mechanical designer, struck a deal with Wells Gardner. He convinced the radio people that combining the sale of Onan generators with a free radio would help both companies. Wells Gardner agreed and made radios available to Onan at their cost, allowing a clever promotional strategy: “Buy an Onan AC generator unit and get a popular Wells Gardner radio free. ” It boosted sales greatly and helped get Onan established in the generator market. The following year D. W. Onan struck an even more important deal with another company — this time Montgomery Ward, the giant catalog company. Onan convinced Montgomery Ward to market Onan-made generator sets through its catalogs, and the sales to the big chain during the next several years made an important contribution to Onan’s profit statement. Montgomery Ward bought its first Onan generator sets in October 1931, and during that lean decade purchased nearly three-quarters of a million dollars worth of Onan products. In 1932, the first full year of the marketing agreement, Montgomery Ward added $32,831 to Onan revenues, and the amount grew each year, reaching a peak of $164,373 in 1938. Sales to Montgomery Ward slipped $90,664 the next year and continued to fall until World War II eliminated all non-military orders. As important as Montgomery Ward was to the Onan sales picture, it was still the direct marketing efforts by D. W. Onan that made the company successful during the trying 1930s. In 1928, the first year Onan generators were available, the company sold only $12,081 worth of them; sales of the “Safty Saw” were still the mainstay of the company. 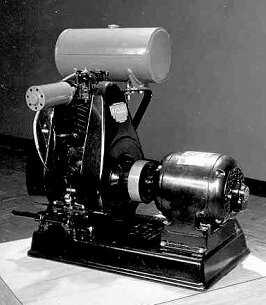 In 1929 generator sales climbed to $56,942, a big increase but still only about half of saw sales. As the popularity of the “Safty Saw” declined in the following years, the sales of generators mushroomed. In 1930, before the Montgomery Ward deal, Onan had generator sales of $88,475, and total revenues grew considerably in the following five years thanks primarily to the addition of the Ward catalog sales. Profitability was greatly increased, starting in 1931, when the Onan company decided to produce its own generators and engines, eliminating Master Motors and Briggs & Stratton as suppliers. Larger capacity units also were added with 1,500 and 2,000 watt generator sets becoming quite popular as homes in rural areas added more and more electrical appliances. The establishment of the Rural Electrification Administration after President Franklin D. Roosevelt took office in 1933 premised to cause serious problems as farm areas were wired for electricity just like their city cousins. By 1935, Onan itself sold $117,994 in generator sets in addition to the $84,774 in business to Montgomery Ward. There was another $19,000 in miscellaneous sales. By 1939, Onan increased generator set sales to $348,809 while Montgomery Ward contributed another $90,664. A decision by D. W. Onan to vastly increase his promotion overseas spurred foreign sales to offset the loss of U.S. rural areas, and the company continued to grow. And by then foreign business contributed almost 80 percent of total sales, an amazing feat for a small company located so far from the normal export centers. Here are links to other promotional material relating to the Ten-Lite era. Ten-Lite demonstration unit: It was not uncommon to demonstrate the unit one day and wire the property to have lights the next day. Ten-Lite Complete An early promotion piece which highlighted the product as well as the need. 1929 Models The expansion of the Ten-Lite program into models from 350 watts to 1500 watts in both AC and DC, and manual or electric starting. DC was satisfactory when lighting was the only load. The bulbs burned a little brighter. As home appliances with motors came along, AC was reqired. Users Say He liked testimonials. This big sheet, about 16×20, has enough folds so it probable accompanies every sales letter.